The EBCO UCR 60 is a quality intuitive mid motor e-bike at a competitive, affordable price. Available in both roadster and low step frames. The UCR 60 ebike uses the reliable TranzX motor system, components and batteries resulting in a quality ebike at an affordable price. It uses market-leading technology and componentry incorporating CanBus/Logix computer diagnostic capability giving you more efficient and accurate information from your EBCO service. Powered by the tried and tested 250watt TranzX M25-GT central motor series it will assist you up to 15.5mph (the maximum speed allowed by UK/EU regulation) EBCO has integrated the motor into the bottom bracket allowing it to connect directly to the chainring as well as adding a ride sensitive torque sensor resulting in increased acceleration, efficiency and performance. A 36 volt 400wh lithium-ion battery powers the ebike enabling it to give a range of 30-50 miles* of enjoyable ebike riding between charges. You can charge the batteries on the bike or unlock and remove them to charge. This will take five-six hours to charge from flat. It benefits from full mudguards and a fully integrated lighting system which means the lights are powered by the ebike battery and come on automatically when there isn’t enough daylight. The weight of the bike is approximately 25kg including the battery. There are three support levels and Shimano Nexus 7 speed hub gears. The Alex DH-19 rims 26” on the 48cm frame and 28″ on the 52cm frame come with Schwalbe Energiser puncture resistant tyres giving a good combination traction on the road and long range by reducing friction on the road. Frames are warranted for five years. 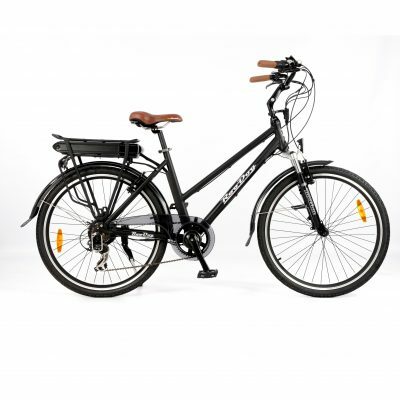 The battery, motor, branded accessories, front forks and electrical components on this ebike is guaranteed for two years. Delighted with the bike. Although somewhat more expensive than other bikes I had tried, the performance of this bike is so much better. Weight being a consideration, as it goes in a motorhome, the performance aspects certainly outweigh any concerns. It is a pleasure to ride and the range is very good.